Shaolin Kung Fu (Chinese: 少林功夫; pinyin: Shàolín gōng fu), also called Shaolin Wushu (少林武術; Shàolín wǔshù) or Shaolin quan (少林拳; Shàolín quán), is one of the oldest, largest, and most famous styles of wushu or kungfu. It combines Zen Buddhism and martial arts and originated and was developed in the Shaolin temple in Henan province, China during its 1500-year history. 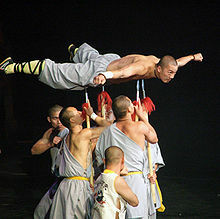 Popular sayings in Chinese folklore related to this practice include "All martial arts under heaven originated from Shaolin" and "Shaolin kung fu is the best under heaven," indicating the influence of Shaolin kung fu among martial arts. The name Shaolin is also used as a brand for the so-called external styles of kung fu. Many styles in southern and northern China use the name Shaolin. Chinese historical records, like Spring and Autumn Annals of Wu and Yue, the Bibliographies in the Book of the Han Dynasty, the Records of the Grand Historian, and other sources document the existence of martial arts in China for thousands of years. For example, the Chinese martial art of wrestling, Shuai Jiao, predates the establishment of Shaolin temple by several centuries. Since Chinese monasteries were large landed estates, sources of considerable regular income, monks required protection. Historical discoveries indicate that, even before the establishment of Shaolin temple, monks had arms and also practiced martial arts. In 1784 the Boxing Classic: Essential Boxing Methods made the earliest extant reference to the Shaolin Monastery as Chinese boxing's place of origin. This is, however, a misconception, but shows the historical importance of Shaolin kung fu. In 495 AD, Shaolin temple was built in the Song mountain, Henan province. The first monk who preached Buddhism there was the Indian monk named Buddhabhadra (佛陀跋陀罗; Fótuóbátuóluó), simply called Batuo (跋陀) by the Chinese. There are historical records that Batuo's first Chinese disciples, Huiguang (慧光) and Sengchou (僧稠), both had exceptional martial skills. For example, Sengchou's skill with the tin staff is even documented in the Chinese Buddhist canon. After Buddhabadra, the monk Bodhidharma (菩提达摩; Pútídámó), described as either Central Asian or Indian  and simply called Damo (达摩) by the Chinese, came to Shaolin in 527 AD. His Chinese disciple, Huike (慧可), was also a highly trained martial arts expert. There are implications that these first three Chinese Shaolin monks, Huiguang, Sengchou, and Huike, may have been military men before entering the monastic life. Some popular stories consider Bodhidharma, the first patriarch of Chinese Buddhism, as the founder of Shaolin kung fu. During the short period of the Sui dynasty (581–618), the building blocks of Shaolin kung fu took an official form, and Shaolin monks began to create fighting systems of their own. The 18 methods of Luohan with a strong Buddhist taste were practiced by Shaolin monks since this time, which was later used to create more advanced Shaolin martial arts. Shaolin monks had developed very powerful martial skills, and this showed itself until the end of the Sui dynasty. Like most dynastic changes, the end of the Sui Dynasty was a time of upheaval and contention for the throne. The oldest evidence of Shaolin participation in combat is a stele from 728 that attests to two occasions: a defense of the monastery from bandits around 610 and their role in the defeat of Wang Shichong at the Battle of Hulao in 621. Wang Shichong declared himself Emperor. He controlled the territory of Zheng and the ancient capital of Luoyang. Overlooking Luoyang on Mount Huanyuan was the Cypress Valley Estate, which had served as the site of a fort during the Jin and a commandery during the Southern Qi. Sui Emperor Wen had bestowed the estate on a nearby monastery called Shaolin for its monks to farm but Wang Shichong, realizing its strategic value, seized the estate and there placed troops and a signal tower, as well as establishing a prefecture called Yuanzhou. Furthermore, he had assembled an army at Luoyang to march on the Shaolin Temple itself. The monks of Shaolin allied with Wang's enemy, Li Shimin, and took back the Cypress Valley Estate, defeating Wang's troops and capturing his nephew Renze. Without the fort at Cypress Valley, there was nothing to keep Li Shimin from marching on Luoyang after his defeat of Wang's ally Dou Jiande at the Battle of Hulao, forcing Wang Shichong to surrender. Li Shimin's father was the first Tang Emperor and Shimin himself became its second. Thereafter Shaolin enjoyed the royal patronage of the Tang. Though the Shaolin Monastery Stele of 728 attests to these incidents in 610 and 621 when the monks engaged in combat, it does not allude to martial training in the monastery, or to any fighting technique in which its monks specialized. Nor do any other sources from the Tang, Song and Yuan periods allude to military training at the temple. According to Meir Shahar, this is explained by a confluence of the late Ming fashion for military encyclopedias and, more importantly, the conscription of civilian irregulars, including monks, as a result of Ming military decline in the 16th century. Stele and documentary evidence shows the monks historically worshiped the Bodhisattva Vajrapani's "Kimnara King" form as the progenitor of their staff and bare hand fighting styles. From the 8th to the 15th centuries, no extant source documents Shaolin participation in combat; then the 16th and 17th centuries see at least forty extant sources attest that, not only did monks of Shaolin practice martial arts, but martial practice had become such an integral element of Shaolin monastic life that the monks felt the need to justify it by creating new Buddhist lore. References to Shaolin martial arts appear in various literary genres of the late Ming: the epitaphs of Shaolin warrior monks, martial-arts manuals, military encyclopedias, historical writings, travelogues, fiction, and even poetry. These sources, in contrast to those from the Tang Dynasty period, refer to Shaolin methods of combat unarmed, with the spear, and with the weapon that was the forte of the Shaolin monks and for which they had become famous, the staff. By the mid-16th century military experts from all over Ming China were travelling to Shaolin to study its fighting techniques. Around 1560 Yú Dàyóu travelled to Shaolin Monastery to see for himself its monks' fighting techniques, but found them disappointing. Yú returned to the south with two monks, Zongqing and Pucong, whom he taught the use of the staff over the next three years, after which Zongqing and Pucong returned to Shaolin Monastery and taught their brother monks what they had learned. Martial arts historian Tang Hao traced the Shaolin staff style Five Tigers Interception to Yú's teachings. The earliest extant manual on Shaolin kung fu, the Exposition of the Original Shaolin Staff Method was written in around 1610 and published in 1621 from what its author Chéng Zōngyóu learned during a more than ten-year stay at the monastery. Conditions of lawlessness in Henan—where the Shaolin Monastery is located—and surrounding provinces during the late Ming Dynasty and all of the Qing Dynasty contributed to the development of martial arts. Meir Shahar lists the martial arts T'ai chi ch'uan, Chang Family Boxing, Bāguàquán, Xíngyìquán and Bajiquan as originating from this region and this time period. From the 1540s to the 1560s, pirates known as wokou raided China's eastern and southeastern coasts on an unprecedented scale. The geographer Zheng Ruoceng provides the most detailed of the 16th-century sources which confirm that, in 1553, Wan Biao, Vice Commissioner in Chief of the Nanjing Chief Military Commission, initiated the conscription of monks—including some from Shaolin—against the pirates. Warrior monks participated in at least four battles: at the Gulf of Hangzhou in spring 1553 and in the Huangpu River delta at Wengjiagang in July 1553, Majiabang in spring 1554, and Taozhai in autumn 1555. The monks suffered their greatest defeat at Taozhai, where four of them fell in battle; their remains were buried under the Stūpa of the Four Heroic Monks (Si yi seng ta) at Mount She near Shanghai. The monks won their greatest victory at Wengjiagang. On 21 July 1553, 120 warrior monks led by the Shaolin monk Tianyuan defeated a group of pirates and chased the survivors over ten days and twenty miles. The pirates suffered over one hundred casualties and the monks only four. Not all of the monks who fought at Wengjiagang were from Shaolin, and rivalries developed among them. Zheng chronicles Tianyuan’s defeat of eight rival monks from Hangzhou who challenged his command. Zheng ranked Shaolin first of the top three Buddhist centers of martial arts. Zheng ranked Funiu in Henan second and Mount Wutai in Shanxi third. The Funiu monks practiced staff techniques which they had learned at the Shaolin Monastery. The Wutai monks practiced Yang Family Spear (楊家槍; pinyin: Yángjiā qiāng). Shaolin monks demonstrate kung fu. Shaolin temple has two main legacies: Chan (禅), which refers to Chan Buddhism, the religion of Shaolin, and Quan (拳), which refers to the martial arts of Shaolin. In Shaolin, these are not separate disciplines and monks have always pursued the philosophy of the unification of Chan and Quan (禅拳合一; chan quan he yi). In a deeper point of view, Quan is considered part of Chan. As late Shaolin monk Suxi said in the last moments of his life, "Shaolin is Chan, not Quan." Basic skills (基本功; jīběn gōng): These include stamina, flexibility, and balance, which improve the body abilities in doing martial maneuvers. In Shaolin kung fu, flexibility and balance skills are known as "childish skill" (童子功; tóngzǐ gōng), which have been classified into 18 postures. Qigong meditation: Qigong meditation itself has two types, internal (内; nèi), which is stationary meditation, and external (外; wài), which is dynamic meditation methods like Shaolin four-part exercise (si duan gong), eight-section brocade (八段锦; bā duàn jǐn), Shaolin muscle-changing scripture (易筋经; yì jīn jīng), and others. The 72 arts: These Include 36 soft and 36 hard exercises, which are known as soft and hard qigong. Combat skills (拳法; quánfǎ, "skills"): These include various barehanded, weapon, and barehanded vs. weapon routines (styles) and their combat (散打; sàndǎ) methods. Like the usual system of Chinese martial arts, Shaolin combat methods are taught via forms (套路; tàolù). Forms that are technically closely related are coupled together and are considered of the same style (sub-style is a better choice for the word). These are usually called the small and the big forms, like the small and big hong quan, which altogether make the Shaolin hong quan style, and the small and big pao quan, etc. There are also some styles with one form, like taizu chang quan. Indeed, these styles are not complete or stand-alone, this is just a classification of different forms of Shaolin kung fu based on their technical contents. Arhat's 18 hands (罗汉十八手; luóhàn shíbā shǒu): known as the oldest style. Some lineages of karate have oral traditions that claim Shaolin origins. Martial arts traditions in Japan, Korea, Sri Lanka and certain Southeast Asian countries cite Chinese influence as transmitted by Buddhist monks. Recent developments in the 20th century such as Shorinji Kempo (少林寺拳法) practised in Japan's Sohonzan Shorinji (金剛禅総本山少林寺) still maintains close ties with China's Song Shan Shaolin Temple due to historic links. Japanese Shorinji Kempo Group financial contributions to the maintenance of the historic edifice of the Song Shan Shaolin Temple in 2003 received China's recognition. ^ Canzonieri, Salvatore. "The Emergence of the Chinese Martial arts". Han Wei Wushu (23). ^ Henning, Stanley (1999b). "Martial arts Myths of Shaolin Monastery, Part I: The Giant with the Flaming Staff". Journal of the Chenstyle Taijiquan Research Association of Hawaii. 5 (1). ^ a b Henning, Stanley E. (Fall 1999). "Academia Encounters the Chinese Martial arts". China Review International. 6 (2): 319–332. doi:10.1353/cri.1999.0020. ISSN 1069-5834. ^ Zhāng Kǒngzhāo 張孔昭 (c. 1784). Boxing Classic: Essential Boxing Methods 拳經拳法備要 Quánjīng Quánfǎ Bèiyào (in Chinese). ^ a b Kit, Wong Kiew (2002). Art of Shaolin Kung Fu: The Secrets of Kung Fu for Self-Defense Health and Enlightenment. ^ Order of the Shaolin Ch'an (2004, 2006). The Shaolin Grandmaster's Text: History, Philosophy, and Gung Fu of Shaolin Ch'an. Oregon. ^ Broughton, Jeffrey L. (1999), The Bodhidharma Anthology: The Earliest Records of Zen, Berkeley: University of California Press, ISBN 0-520-21972-4. pp. 8, 54-55. ^ Canzonieri, Salvatore (February – March 1998). "History of Chinese Martial arts: Jin Dynasty to the Period of Disunity". Han Wei Wushu. 3 (9). ^ Wong, Kiew Kit (2002). The Art of Shaolin Kung Fu: The Secrets of Kung Fu for Self-Defense Health and Enlightenment. Tuttle martial arts Boston, Mass. p. 13. ^ a b c Shahar, Meir (2008). The Shaolin Monastery: History, Religion, and the Chinese Martial Arts. Honolulu: University of Hawai'i Press. ISBN 0824831101. ^ Liu, James J.Y. (1967). The Chinese Knight Errant. London: Routledge and Kegan Paul. pp. 87–88. ISBN 0-2264-8688-5. ^ a b Shahar, Meir (2000). "Epigraphy, Buddhist Historiography, and Fighting Monks: The Case of The Shaolin Monastery". Asia Major Third Series. 13 (2): 15–36. ^ a b c d e f g h i j k l Shahar, Meir (December 2001). "Ming-Period Evidence of Shaolin Martial Practice". Harvard Journal of Asiatic Studies. Harvard Journal of Asiatic Studies, Vol. 61, No. 2. 61 (2): 359–413. doi:10.2307/3558572. ISSN 0073-0548. JSTOR 3558572. ^ Chéng Zōngyóu 程宗猷 (c. 1621). Exposition of the Original Shaolin Staff Method 少林棍法闡宗 Shàolín Gùnfǎ Chǎnzōng (in Chinese). ^ Henning, Stanley (Autumn–Winter 1994). "Ignorance, Legend and Taijiquan" (PDF). Journal of the Chenstyle Taijiquan Research Association of Hawaii. 2 (3): 1–7. Archived (PDF) from the original on 23 February 2011. ^ Francis, B.K. (1998). Power of Internal Martial Arts: Combat Secrets of Ba Gua, Tai Chi, and Hsing-I. North Atlantic Books. ^ Bishop, Mark (1989). Okinawan Karate: Teachers, Styles and Secret Techniques. A&C Black, London. ISBN 0-7136-5666-2. ^ "Shaolin kungfu". www.shine.cn. Archived from the original on 30 April 2018. Retrieved 30 April 2018. ^ "Shorinji Kempo 50th Anniversary Commemoration". Archived from the original on 8 July 2006. Retrieved 25 May 2006. ^ "China's State-level Friendship Award Given to Shorinji Kempo Group Chairperson". Archived from the original on 12 March 2007. Retrieved 25 May 2006. This page was last edited on 8 April 2019, at 14:09 (UTC).